"Go west young man" was an expression made popular by 19th century editorialist Horace Greely. Those words were penned in 1851 by John Babsone Lane Soule and they have inspired men and women to travel west for nearly 150 years. The romantic magnetism of the west has drawn cowboys, businessmen, kings, gamblers, thieves, miners, inventors and dreamers from their comfortable homes. They have come from every far-flung corner of the earth. Have you ever wondered what the west was like before it was bought, sold and parceled into little pieces? Have you ever wished that you could take a time machine and live in the 19th century? With only a few modern reminders of humankind's existence along the 64-mile ribbon of steel, the Grand Canyon Railway (GCR) and a vivid imagination are the only tools necessary to travel back to the turn-of-the-century wild west. The area between Williams, Arizona and the Grand Canyon is rich with history. Sheepherders, cattlemen, indians of numerous tribes, kings, presidents, conquistadors and common folk have all traveled these parts for hundreds of years. In 1540, the conquistador Coronado wandered the area with two dozen Spaniards looking for the fabled golden Seven Cities of Cibola. Instead of finding gold for the Viceroyalty of Spain, they became the first Europeans to see the Grand Canyon. That was a treasure greater than gold. A September 1857 expedition led by Lt. Edward F. Beale, complete with camels and their Greek and Turkish handlers, traveled through here. The trail that Beale blazed through northern Arizona is still visible today. The Beale Trail parallels the railway for one and a half miles at milepost 14 and then heads west. Teddy Roosevelt spent time at the Grand Canyon, as did legendary Rough Rider William "Bucky" O'Neill. The GCR crosses the ancient paths of all of them. Grading for the Grand Canyon Railway began in June of 1899. After this enormous engineering feat was completed, travel from the Williams Depot to the Grand Canyon began on September 17, 1901. For decades it was a struggle to keep the railway profitable, and unfortunately, travel on the GCR ended on July 30, 1968. From that date until the summer of 1974, the railway was intermittently used for freight. In 1974 the Santa Fe Railroad permanently abandoned the tracks and destroyed many trackside buildings. At that point the railway was destined to be a distant memory. In September 1977, TV personality Arthur Godfrey and several others made plans to resurrect the Canyon Railway. Their plans fell through. The railway changed ownership a number of times after Godfrey's unsuccessful resurrection, with each owner failing to accomplish what they had set out to do. Just when it seemed no one would ever hear a lonesome whistle again while on their way to the Grand Canyon, the railway was reborn September 17, 1989, exactly 88 years from its humble beginning in 1901. Entrepreneurs brought the Grand Canyon Railway back to life and today, trains carry well over 200,000 people by rail to the canyon each year. The GCR is an environmentally conscious entity. Steam engines used to haul passengers to the Grand Canyon have been converted from burning coal to running on a cleaner-burning fuel of oil and gray water. For years the railway operated steam engines from Memorial Day to Labor Day, but in 2008 they discontinued regular runs because of environmental considerations. Operating an all-diesel fleet of locomotives year-round saves a considerable amount of fuel and reduces greenhouse gas emissions and air pollutants associated with steam locomotives. Another tangible benefit to the Grand Canyon's fragile environs is the reduction of approximately 50,000 automobiles and their pollution each year. The Williams Depot, built in 1908, and standing at an elevation 6,767 feet, is an attraction in itself. It presently looks no different than it did so many years ago. In fact, the brick loading platform where you board the train is the original platform set in 1908. While you are waiting for the train to leave, you can visit the museum located next to the depot. Here you will see steam Locomotive Number 20 -- built in 1910 -- along with its tender (a small coal car), and a Harriman coach car, built in 1923. If you're hungry, there is a delicious breakfast buffet available in the Grand Depot Café. 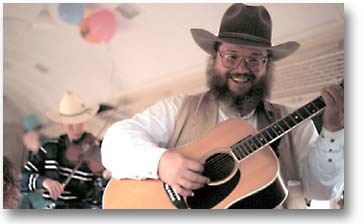 If you are there in the evening, don't miss the show put on by David Bixby & Friends, it's wild west fun at its best! Your adventure really gets under way when the train slowly leaves the Williams Depot at roughly 9:30 am. As you head north you feel the gentle swaying of the Harriman cars, built in 1923. The sound of the clickity clack, clickity clack of the old railroad tracks is very soothing, but don't let this lull you into a cat nap or you will miss the beautiful scenery that the GCR affords. On this 5-hour round-trip railway excursion, you can expect to see the west's diversity of nature. Look out your window and scan the horizon for signs of life. You will see many Hereford, Longhorn and Angus cows. You may also be treated to a wide variety of Arizona's wildlife, such as elk, mule deer, antelope, mountain lion, badger, bobcat, coyote, grey fox, black bear, cottontail and jackrabbit. And as far as winged creatures go, it's possible to spot a bald eagle, blue heron, horned owl, Peregrine falcon, red-tailed hawk, or a turkey vulture perched on a tree waiting for its next meal. The Kaibab National Forest is host to mesquite, desert willow, Colorado pinyon, ponderosa pine, mountain mahogany, manzanita, Douglas fir, quaking aspen, Englemann spruce, white fir and blue spruce, to mention a few. You may even see a Utah agave, a.k.a. century plant, in full bloom! This is always an extra special occurrence because it takes from 15 to 25 years to bloom and then it dies. The real treat is the hospitality of the Grand Canyon Railway's employees. Because the 64-mile two-and-a-half hour trip can be a bit daunting, they work hard at keeping the passengers comfortable and entertained. They are helpful, informative, and generally interested in the safety and well-being of their passengers. Jill, our hostess, was pretty inventive. She told some true stories of years past and jokes to keep the children entertained. We were served complementary commemorative issue Coca-Colas (in the small glass bottles) to and from the Canyon. Water is freely available while traveling, as there is a need to stay hydrated in the desert. Bottled water and snack foods are also available. Periodically during the trip cowboy balladeers work their way through the passenger cars singing songs and cajoling the passengers. If the time seems to be dragging on, look out your passenger window and visualize what hardships had to be endured 100 to 350 years ago for Coronado, Beale and those unnamed souls who tried to carve out trails and travel through such a harsh, unforgiving land. You may wonder what those individuals who saw the Grand Canyon for the first time must have thought. So if you're impatient to get to the Grand Canyon, remember that it took those early travelers weeks, months or even years, to cover the territory we cover in mere hours or a few days. The rewards of riding the Grand Canyon Railway include the nostalgia and romance of the wild west. The hospitality of all the employees, the hostesses, engineers, conductors, balladeers, cowboys, and train robbers at the Williams Depot and the GCR was very welcomed. (Yes! Train robbers! Did I forget to mention them?) 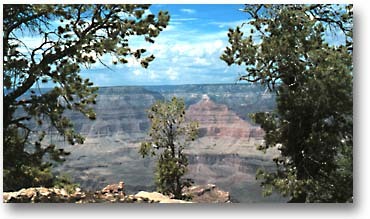 Last but not least, the biggest reward of all is that of viewing the grandest canyon on the face of the earth! 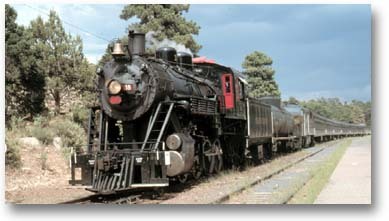 There are five classes of travel on the Grand Canyon Railway: Please be aware that rates and schedules are subject to change, so call ahead for the latest information. Deluxe Observation Class (No children 16 and under permitted in this class). Also available: One, two or three night packages; one-way fares; optional train/bus combinations to and from the Grand Canyon; group rates and charters. 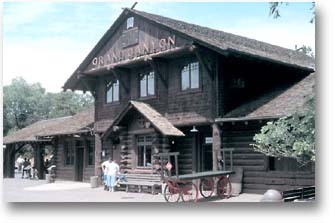 Handicapped access to the train and rim tours is available but limited, please inquire. Train Schedule -- Daily service (except December 24, 25). Timetable: Passengers are encouraged to check in at the Williams Depot ticket counter by 8:00 a.m. or earlier. Grand Canyon Railway departs Williams at 9:30 a.m. sharp; arrives Grand Canyon at 11:45 am; departs Grand Canyon at 3:30 pm sharp; and returns to Williams at 5:45 pm. Williams, the Arizona gateway to the Grand Canyon, is easily accessible on interstate highways from the West's most popular cities. Take Interstate 40 to exit 163; follow Grand Canyon Blvd. 1/2 mile south to the historic 1908 Williams Depot.